Not all of us are cut out for country life. 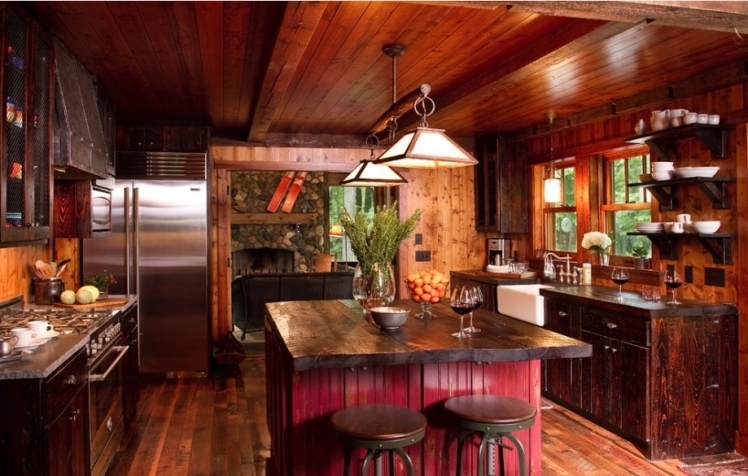 However, you don’t have to live out in sticks or own a log cabin to enjoy a rustic interior. 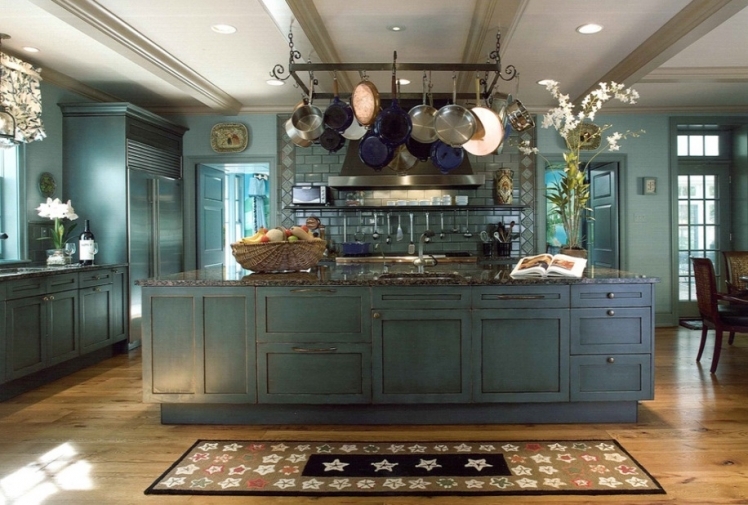 The kitchen, as the hub of your home, is an ideal room to transform into a cozy country cottage. Here’s a few ways you stage this transformation. 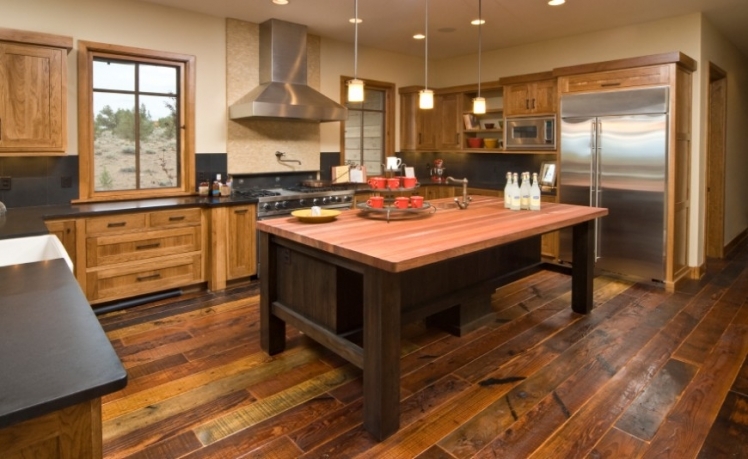 Wide wooden plank flooring and time-worn wood cabinets: these are all bold wooden elements that bring nature into your kitchen design. The more worn the better; the more knots in the wooden pine wall show where the branches once grew. 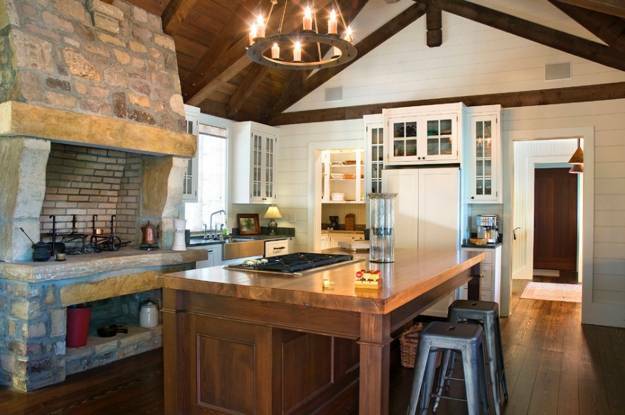 No country kitchen design is complete without large, exposed wooden beams installed on the ceiling adding not only structural support, but style as well. Using red as an accent color throughout your kitchen adds a folksy touch to the room. 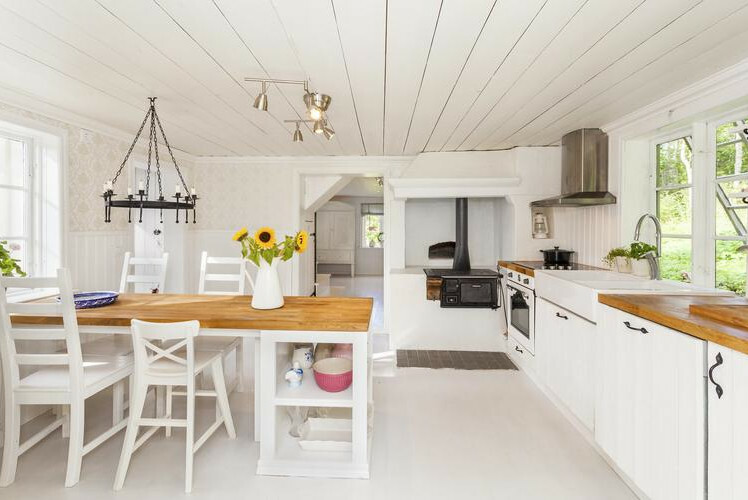 Dark wood may not be everyone’s taste, so for small, dimly-lit kitchens, painting or bleaching your wooden panels might bring some much-need light to an otherwise dreary room. 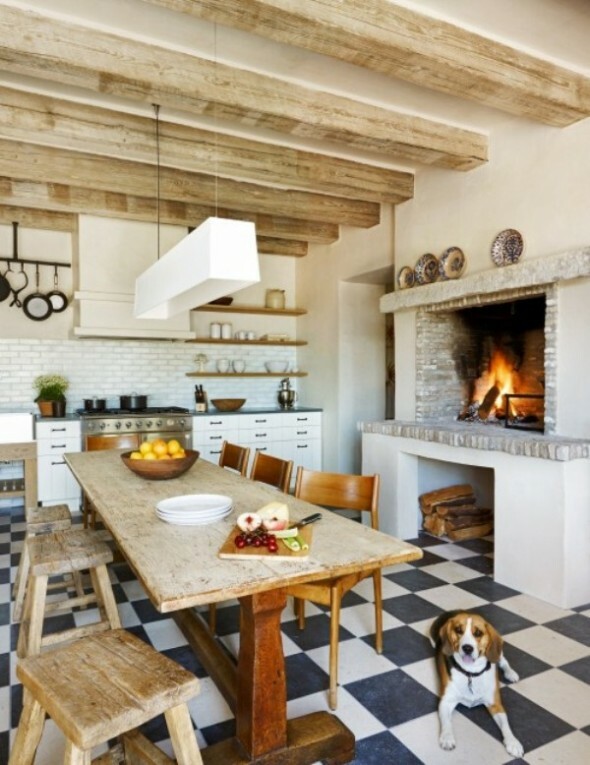 There’s more to the rustic look than wood! 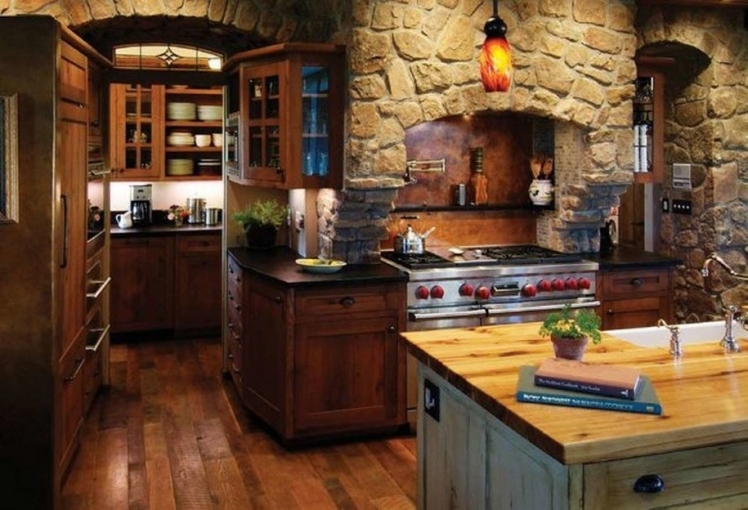 Add hints of stone to your fireplace or cover a whole wall with large river rock to add a country flare to your kitchen design. What better way to add warmth to a room than with a real wood-burning fireplace? 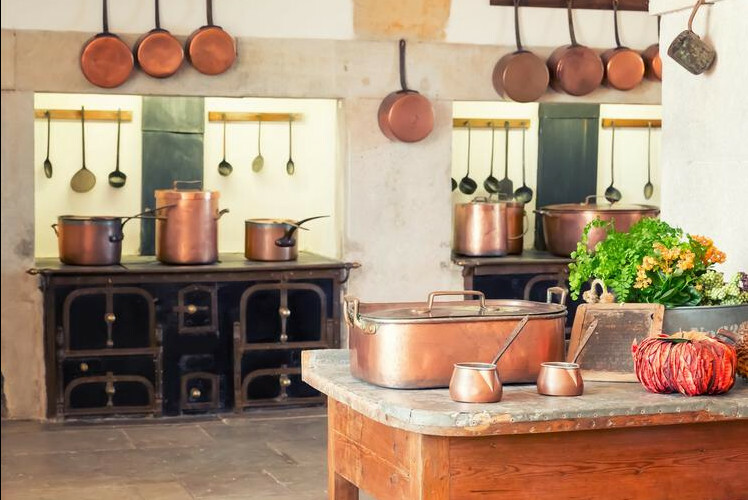 You can install a vintage heirloom stove if you’re just wanting it for decoration, or consider installing a new wood-cook stove that you can actually use! Having a customized wrought-iron pot rack with a shiny set of copper pots dangling is an important accent to have in any rustic kitchen. If iron isn’t in the budget you can always repurpose an old window frame by hanging it from the ceiling with chains and adding large S-hooks around the frame to act as pot holders. The industrial look of stainless steel balances out the warmth of the wood and helps to add a bit of a trendy look to your space. 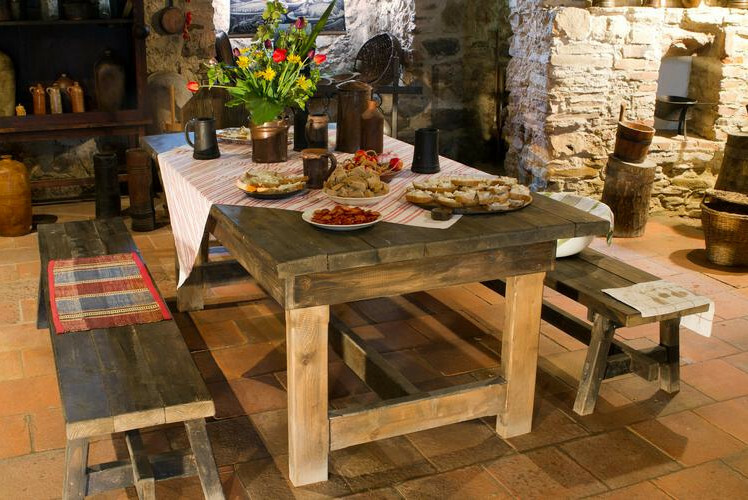 Add to the wooden theme by building a simple wood table and two benches as your family’s meal destination. It’ll feel like you’re picnicking indoors! 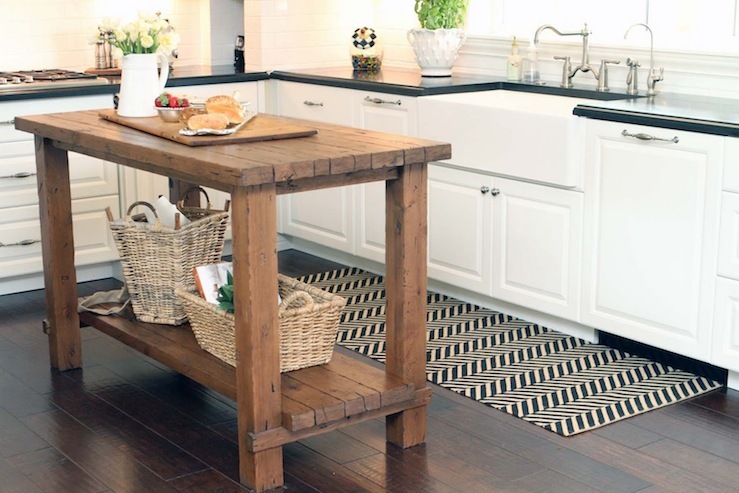 Installing a custom-made natural-wood mobile kitchen island will provide a down-home focal point for your room. 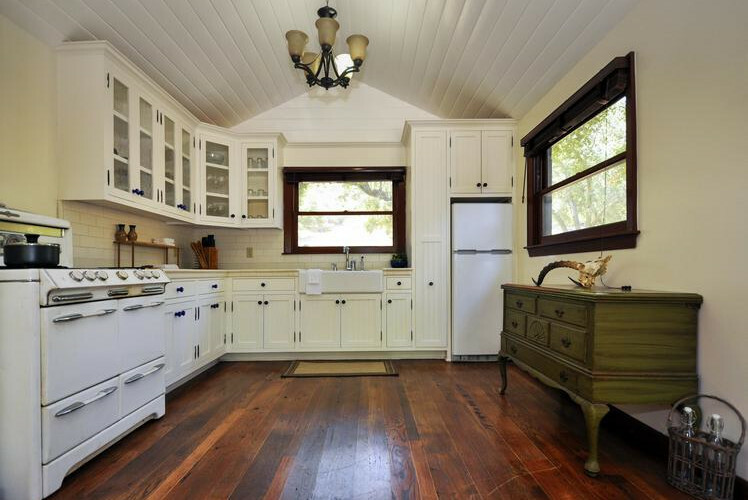 For a more sophisticated country look, install white cabinetry. Pair it with glass inserts and crown molding at the top. 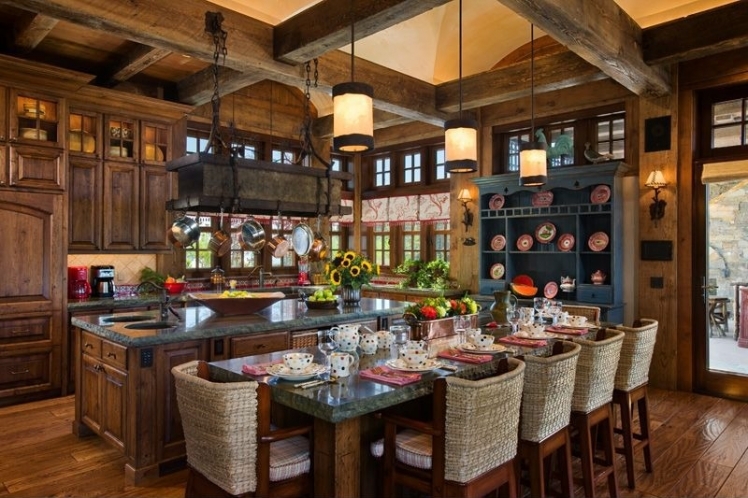 Black granite countertops and stainless steel appliances take the rustic edge to this type of country kitchen design and give it a modern touch. Another way to class up your country look is to add a gorgeous wrought-iron chandelier hanging over the dinner table or island. 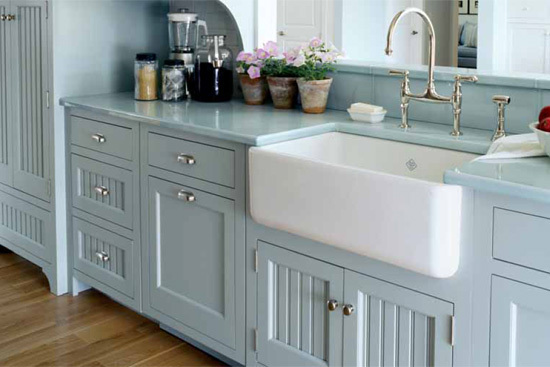 One easy way to turn your kitchen country is to add what is known as a farmhouse-style sink. This stylish, fronted sink requires special installation methods than standard sinks, but it’s worth it as it provides far more space than ordinary sinks. 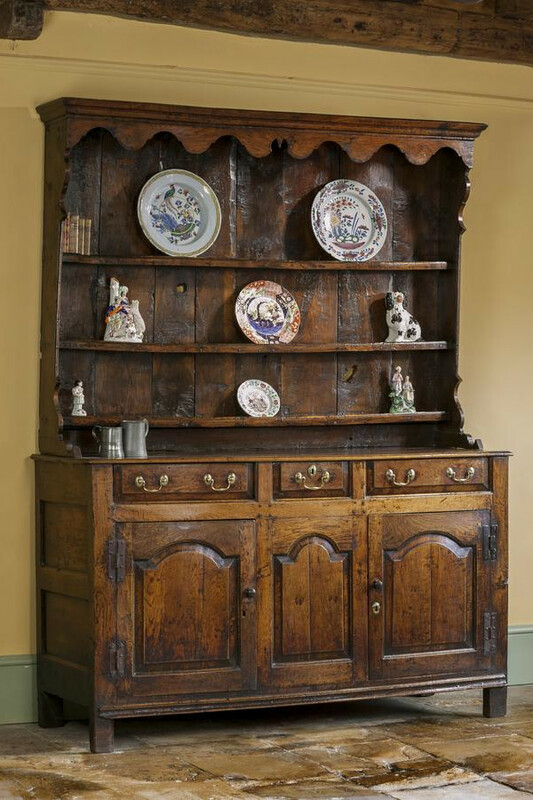 Incorporating hand carved wooden furniture into your kitchen’s design scheme is a great way to add a homespun look to the space. 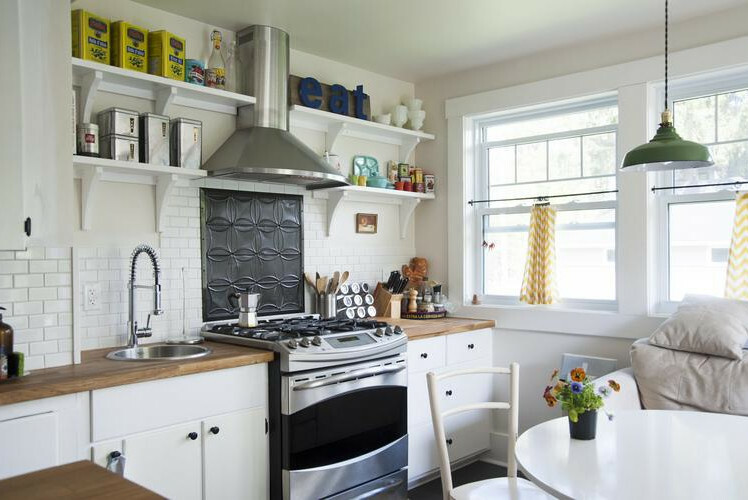 Vintage stoves fits in with the traditional aesthetic of a country kitchen. Plus, it makes an instant conversation starter!